Toll Lane 3 & 4 reconstruction continues. During the weekend of 08/26 – 08/28/16, Toll Lanes 3 & 4 will reopen and Toll Lanes 5 & 6 will be closed to accommodate staged construction. Toll Lanes 5 & 6 are expected to be closed for 10 weeks. 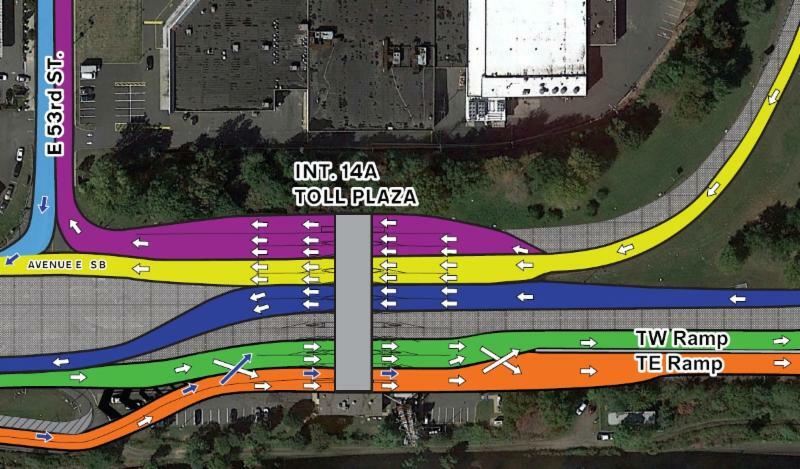 In support of the Toll Plaza work, northbound Avenue E will be temporarily reduced to a single lane between 52nd Street and the Toll Plaza to implement the change. This work will be supported by Bayonne Police. On 08/28/16, traffic will be shifted left on the ramp to westbound HCE to accommodate a new work zone on the right. During the weekend of 09/10-09/11/16, NJ Transit Light Rail Service between 34th Street Station in Bayonne and Danforth Avenue Station in Jersey City will be maintained via NJ Transit bus service. During this period, new bridge beams will be erected over the NJ Transit and Conrail train tracks. During the weekend of 08/26/16, northbound and southbound Route 440 will be reduced to a single travel lane in each direction and the southbound Pulaski Street Jughandle will be closed, 7:00PM Friday through 4:00AM Monday, for bridge girder erection. In addition, overnight, Friday night and Saturday night, 10:00PM to 8:00AM, Route 440 will be detoured through the area. Bayonne and Jersey City Police will provide assistance as needed. On Monday, 08/29/16, the southbound Route 440 Jughandle and entire length of Pulaski Street will be closed from 7:00PM to 4:00AM for milling and paving operations. Traffic will be detoured to Prospect Street/32nd Street U-turn and then onto the ramp to the Turnpike from northbound 440 or Harbor Drive. Police assistance will be provided to allow left turns onto Port Jersey Boulevard at the base of the ramp to access the port. During the weekend of 08/26/16, northbound and southbound Route 440 will be reduced to a single travel lane in each direction and the southbound Jughandle at Pulaski Street will be closed, 7:00PM Friday through 4:00AM Monday, for bridge girder erection. During the weekend of 08/26 – 08/28/16, traffic will be shifted left on the ramp to westbound HCE to accommodate a new work zone on the right. During the evening of 08/25/16, the Route 440 Jughandle to Pulaski Street will be closed, 8:00PM to 5:00AM, for bridge girder erection. This work will also be supported by Bayonne Police. During the weekend of 08/26/16, northbound and southbound Route 440 will be reduced to a single travel lane in each direction and the southbound Pulaski Street Jughandle will be closed, 9:00PM Friday through 4:00AM Monday, for bridge girder erection. In addition, overnight, Friday night and Saturday night, 11:00PM to 8:00AM, Route 440 will be detoured through the area. Bayonne and Jersey City Police will provide assistance as needed. During the week of 08/22/16, the intersection of Center Street and Chosin Few Way (in the former Military Ocean Terminal) will be reduced to a single lane of traffic in the eastbound direction for roadway reconstruction. West bound traffic will be diverted to 40th Street. This work will also be supported by Bayonne Police. Please CLICK HERE for detour. 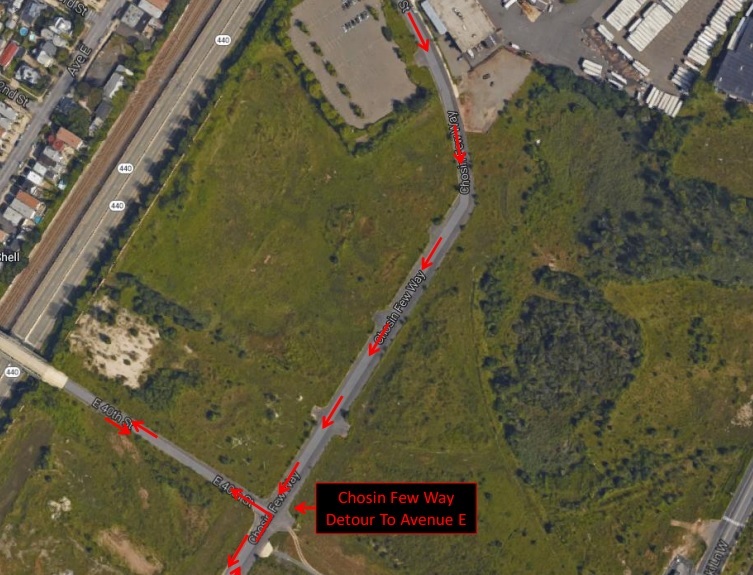 During the week of 08/22/16, the intersection of Center Street and Chosin Few Way (in the former Military Ocean Terminal) will be reduced to a single lane of traffic in the eastbound direction for roadway reconstruction. West bound traffic will be diverted to 40th Street. This work will also be supported by Bayonne Police. Eastbound: Eastbound Ramp to 14A: This ramp will be reduced to one lane from 10P Friday to 4P Sunday. 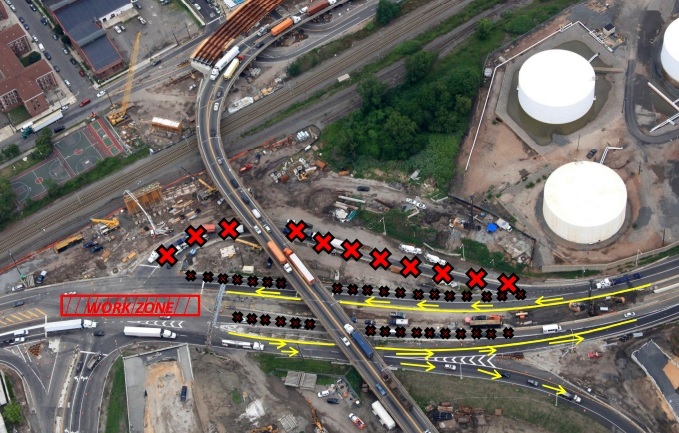 This closing will not extend onto the mainline and is scheduled to be complete before the Sunday evening activation of the Eastbound Shoulder Lane. Westbound: Westbound Interchange 14A – 14: Traffic will be reduced to one lane from 10P Friday to 5A Monday. This closing is necessary to address high priority and emergent bridge deck repairs in the westbound travel lanes. This work has been coordinated with westbound Pulaski and the Bayonne Bridge, both of which will remain open during peak periods Saturday and Sunday. This closing is necessary to address high priority and emergent bridge deck repairs in the westbound travel lanes. Interchange 14A – See Eastbound Ramp to 14A above. See https://www.njta14a.com/category/traffic/ for upcoming traffic advisories. During the weekend of 08/12 – 08/14/16, northbound Avenue E between 52nd Street and the Toll Plaza will be reduced to a single lane to accommodate Toll Lane construction. The traffic will be reduced from 8:00PM Friday to 8:00AM Saturday. This work will be supported by Bayonne Police. A new work zone has been created along the east bound HCE ramp to the Toll Plaza.During the weekend of of 08/19 – 08/21/16, traffic on this ramp will be reduced to a single lane, 9:00PM Friday to 6:00PM Sunday. Begin construction of new bridge deck. This work will be supported by Bayonne Police as needed. During the weekend of 08/12 – 08/14/16, northbound Avenue E between 52nd Street and the Toll Plaza will be reduced to a single lane to accommodate Toll Lane construction. The traffic will be reduced from 8:00PM Friday to 8:00AM Sunday. This work will be supported by Bayonne Police. Deep bridge foundation work will continue on the Pulaski Street jughandle.